Write-on wristbands can be used in every department of a hospital or Health Care Facility, whether your needs are for short term or long term patients. Our wristbands are secure, convenient to use, and allow for easy application of important and relevant patient data. They are ideal for both short and long visits but preferably for short term patient. This type is used more than any other in most Health Care Facilities as they are easy to handle. All products are Latex- and Phthalate free. 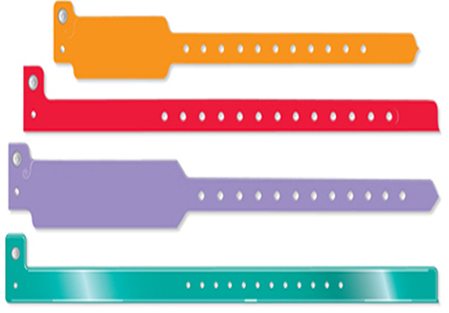 Write-on wristbands are available in a variety of colors, both in snap and adhesive style closures.